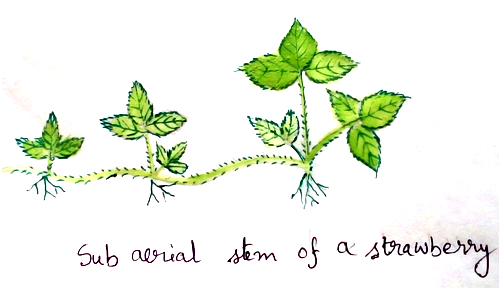 Stem: Stem is the ascending part of the plant axis which develop from the plumule, grows by means of terminal bud and shows differentiation of nodes and internodes. It bears leaves, flowers, fruits and seeds along with buds. Leaf bearing part of the stem is called shoot. Stem branches are exogenous in origin (from surface meristem in the cortex). It is positively phototropic, negatively geotrophic and hydrotrophic. Dichotomous branching – It is rarer in angiosperms . The growing part divided into two parts forming two similar branches while the parent axis disappear. Example-Asclepias syriaca. Lateral branching – The growing point does not divide. Branches are develop from lateral buds lower down from apex. 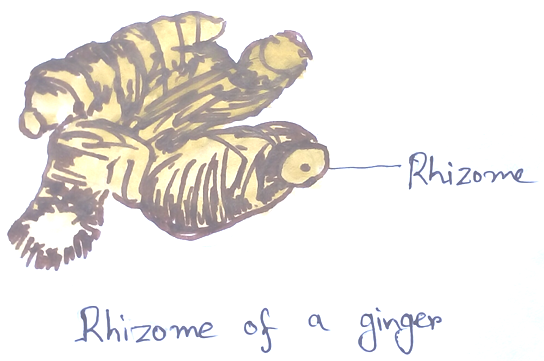 They are of two types –Racemose (Eucalyptus, mustard etc). Types of stem –stems are of three types- reduced (onion, garlic), erect (mango, peepal), weak ( pea, gourd etc). 1. Stem holds leaves, flowers, fruits,buds, branches of plants. 2. It holds the appendages according to their best position for benefit. 3. It helps in transport of water from roots to the leaves for photosynthesis. 4. On the other hand food produced in leaves is transported to different parts of the plant by vascular bundles called phloem. 5. In some cases stem acts as storage house for some plants. In potatoes starch is stored as food in stem. Axillary – Example of axillary stem tendrils is Passiflora. Extra axillary- Example of extra axillary stem tendrils is Luffa and Cucurbita. Floral buds or inflorescence tendrils - Example of inflorescence tendrils is Antigonon. 2. Stem Thorns – They are stiff sharp structures which are formed for reducing transpiration and protection from animals. Thorns are generally axillary. Example- citrus, pomegranate, Bougainville. Thorns of Duranta bears small leaves, thorns of Alhagi bear flowers,terminal thorns occur in Carissa. 3. Phylloclades – They are green, photosynthetic,often succulent stems of indefinite growth. It is an adaptation for dry habitats. The leaves are caducous. Example of phylloclades are Opuntia, Cocoloba etc. In opuntia each segments or phylloclades is a branch that arises in the axil of caducous leaf and possesses raised areas or areoles representing nodes. An areole has a leaf scar, one two spines and a number of stiff hair called bristles or glochidia. In Asparagus the cladodes develop in cluster which are straight or curved, slightly flattened, pointed fleshy structures. Cladodes of Ruscus are leaf like borne in the axis of scales leaves. 5. Underground stem takes part in perennation and vegetative multiplication (potato).